Hernan Cattaneo’s refreshing approach to DJing and making music has ensured that over a decade on from the time he exploded into the public consciousness, he’s still every bit as popular. His contemporary sound continues his love of rich melody and atmospheric textures, but draws on possibly a wider palette of producers and styles than ever. With the renewed interest in what some might call ‘progressive’ styles - Innervisions, Life & Death et al - the time for him to present his sound to the world through this compilation on the very cool Balance label couldn’t be better timed. Disc 1 harks back to the golden age of downtempo music in the 1990s, evoking classic Cafe Del Mar and Northern Exposure mixes with its selection of languid soundscapes. It’s a style that has sadly slipped from the spotlight, coinciding with the death of the chill-out room and the diminished ‘Balearic’ focus of Ibiza in recent years - meaning that Cattaneo’s choice of direction feels all the more special as a result. Indeed, he reaches back to 1999 for the low-slung groove of Boards Of Canada’s opener, before moving into a slew of exclusives and reworked versions of some of his favourite tracks from recent DJ sets to suit the chuggier tempo. The new versions give these dancefloor tracks new context and life - like Chaim’s hypnotic Slow Dance Mix of ‘Blue Shadow’ - while haunting vocal tracks like Weval’s ‘Out Of The Game’ provide contrast to the glistening arps and top lines of Mano Le Tough and John Tejada, and a smattering of classics dear to Cattaneo’s heart, such as Gui Boratto’s ‘Half Life’. As the mix moves towards its conclusion, the energy and tempo nudge their way towards the clubbier climes of the second disc, culminating in a rework of Guy J’s ‘Dizzy Moments’. 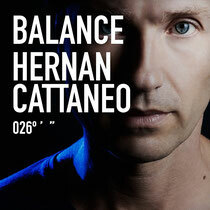 Both mixes are littered with exclusive new productions from Cattaneo and his production partners Soundexile. The driving bass of their own ‘Into The Edge’ propels Disc 2 into life before you plunge into the deeper climbs that he’s known for. More exclusives abound from the duo and others alike, a gently euphoric warmth coming over the mix through their own ‘Parallax’ and ‘Fugazzi’, continuing into driving reworks of Guy J and James Teej. New material from Guy Mantzur powers you through towards the finale, the subdued sound of Cattaneo and Soundexile’s ‘Lotus’ rounding the compilation off. Check the Soundcloud link above for a taster, it’s out 26 September on Balance Music.